Today I've been working on our newest fabric line which will be shown to shop owners at fall quilt market. Barb and I design fabric for Moda Fabrics. We always love getting a package from them. It means our fabric line is getting closer to being finished. It takes about a year from the time we send in our design boards to Cheryl Freydberg, Moda's design director, to bolts of fabric arriving at your local quilt shop. Right now, I'm working on a line called Antique Fair. It will be shown the shop owners at fall quilt market. The fabric comes to me stapled on these cards. Each print is numbered. I'm checking for color and shading today. Also trying to figure out which prints we would like to keep in this collection. Fabric lines are smaller than they used to be. When we first began designing we would have around 42 or so fabrics in a line. Now they are much smaller. It's hard for quilt shops to carry full lines of everyone's fabric. There are a lot of designers to choose from! Barb and I send in 2 lines a year. That can be about 64 bolts right there! After the fabric is printed we each get 2 1/2 yards of each piece of fabric in our collection. That's usually enough to work up some quilts for our books. Moda has kept a library of each fabric printed by their company. You can imagine how big that library is! They are reducing the size of their library and offered us the choice to pick one of our past fabric lines. They sent 2 yards of each piece of Rhubarb and Ginger. Below is a picture of some of the prints in this fabric line. We would like to share this line with you. I have enough for 4 winners. Each winner will receive a 1/2 yd. piece of each fabric in Rhubarb and Ginger. Leave a comment in the comments section and you are signed up for a chance to win. I'm leaving town tomorrow to go to Polk, Nebraska. I'm doing some research for our new quilt book Garden Club. I will be back in time to do the random number generator and pick 4 winners on Sunday morning. oh so yummy fabric!!! looking forward to seeing your new range too! Oh, gorgeous fabrics...I'm addicted to fabric..love the colours shown...Look forward to seeing the new range. What an honor! You are so generous! Rhubarb and Ginger is a lovely line of fabric! It's so fascinating to hear about the process you go through to get your fabric lines on the shelves! And thanks for a great giveaway too! Oh my what beautiful fabric! Thanks for sharing the design process...very interesting. I would love to have a chance to win some of these. Thank you for the opportunity. I love your fabric. I deeply love your fabric! I know exactly what I would make with it! I think it would be so much fun to design it! You are so talented! I have all your books too. I can't wait to see the new ones! Thanks for the great giveaway! Oh my! Love those colors! thanks for sharing the info about how it works, too. I always learn something from you girls! Oh my gosh...I would just hit the ground running to get that fabric ;o) LOL! Please enter my name. It's absolutely beautiful and thank you for such a generous gift. Beautiful new fabric as always! Wow...Rhubarb and Ginger...who wouldn't want these!? Beautiful fabric! !I would love a chance...these would be great to back pinkeeps and flatfolds! Love, love the fabrics. I especially love the alphabet pieces. You are very talented ladies and stitchers and quilters alike are blessed to have you creating for us. What the heck! Please add my name to the pot. Eventually the odds have to be on my side, right? Gorgeous fabric, by the way. I had no idea all the work that goes into that. The new palette looks beautiful and the Ginger and Rhubarb line is just as lovely. Your new fabric line looks fabulous! I'd love to win some of that Rhubarb and Ginger line! Love the sneak peeks of the new line...and Rhubarb and Ginger is absolutely gorgeous! It's always fun to hear about the fabric design process as well! WOW! What a generous giveaway! 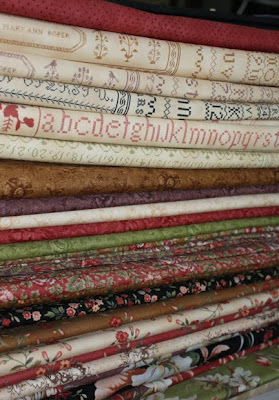 Who ever wins this awesome bundle of fabric will be in quilt heaven!!! Thank you so much for sharing your talent in quilting and stitching! Love both arts! Please include me in your drawing! Can't wiat to see your new line! Seriously one of my most favorite lines by you! Would love to win the Rhubarb & Ginger! And I'm excited for your new lines as well! Beautiful fabrics! Thank you for the opportunity to win a bit of it. seriously though, would love a chance to win, thanks so much! Boy, would I love to win this giveaway! Such a gorgeous line of fabric! And your new one looks grand too! Sigh. Thanks for the chance -- you and Barb are the best! I can't wait until your new fabric is available. Looks like a winner. ooooooooh, I would love to get my hands on all that fabric! Love,love, love it!!!!! They're beautiful! Thanks so much for sharing them with the winners, whoever they might be. Good luck to everyone! And I'm looking forward to seeing your new line too. The fabrics are lovely! Please enter me in the drawing! I wish you a nice and save trip, Alma. Thank you for sharing a bit of the process with us. Those fabrics are absolutely gorgeous! Madiera inspired me to become a quilter!!! It is still my favourite line of fabric and I love it so much- I have two schnibbles made and a big quilt to make with it- did I mention that it is STILL my favourite!!! I always regreted not being around for Rhubarb and Ginger so of course I would love to win some! Thank you so much for such a generous competition! You two inspire me so much and I just want to thank you for that aswell! Thank you! PS The new range looks wonderful! Beautiful Fabric !! Please enter me in your giveaway. Just lovely! I never got any of this when it was out and now you can't find it. I'd be thrilled to win! Quilters spend a considerable amount of time, money, and thought into a quilt. You always design fabrics that are worthy to become part of the end user's labor of love. Looking forward to Antique Fair. I'd love to take part in your Rhubarb and Ginger giveaway. That is so nice of you...love your lines of fabric! I love your fabrics and am looking forward to your new line. Alma, I love all of your fabric lines and your books. I will be looking forward to the new line. The colors look wonderful. I am always amazed at how lovely your fabrics are, tho by now, I shouldn't be!!! I will be watching with bated breath for your new line!! Would love to have more of Rhubarb and Ginger! Oh, thank you so much for the chance!!! I would love any of the Rhubarb & Ginger line! How wonderful!! Please include me!!! How interesting to read about the process of designing fabrics. It would be wonderful to win the beautiful fabrics! 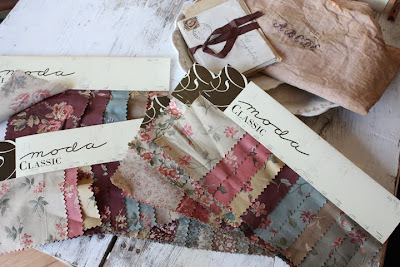 Oh My, Moda has a fabric library??? The selections you have are utterly drool-worthy!!! Please enter me in your giveaway. Your fabric is wonderful. Ohhh...you can never have too much wonderful fabric for a giveaway. Can't wait to see the new line too. Please enter me in your giveaway. Your fabric is lovely! Fabric, research, how does one get such a great job.Love the name of your new line, can hardly wait till it's available. Please enter me in your fabric giveaway. I love all your fabric range and the new one looks very exciting! Roslyn from Australia. I just love your fabric! Thank you for giving us the opportunity to win some of it!! Can't wait to see your new fabric line. You must get to have loads of fun plus a lot of work developing it!! Absolutely beautiful fabrics. Someone is going to have fun creating with those. How generous of you again ! That line is one of my favorites, especially love the sampler one. Rhubarb and ginger would look so great stacked next to my collection of all your books! Ojalá la suerte me acompañe!!! You never think about the time from your thoughts to the bolt I pick at my fabric store - thanks for sharing the interesting process. And oh to think what walking in the library of all the fabrics ever done - I would pass out, I think. The fabrics are gorgeous! Please enter me in the drawing. Rhubarb and Ginger is one of my favorite fabric lines. I would really like for my number to be selected. Thanks for the insight on what it takes to get a line of fabric produced. I now have a new appreciation. Love the new fabric, especially the sampler pieces! Love your designs--- Harvest Home, Beach House... the list goes on and on.... Thanks for sharing the fabric...and sharing your talents. That is a very special gift!!! Thank you for the chance to win that. I'm very excited! Enjoy your Nebraska trip. The fabrics are beautiful! I would love to have a chance to win them! They would find a good home in Nebraska! Sure enjoyed my recent Blackbird classes! I love your blog almost as much as your fabric and cross stitch designs! There's always something wonderful to see here. So much good news in one post! Safe travels, best of luck with the work on your new book and fabric lines! And the Rhubarb and Ginger. . . gorgeous! How exciting to design fabrics. Oh I LOVE the new range Antique Fair and am hoping the random generator picks looks my way, what an honour it would be to receive some of this beautiful fabric and how kind of you to treat your admirers. I love all your fabric!!! ohh it all looks great! This is my most favorite line of the fabrics by you and Barb! What a beautiful things!! Thanks for sharing and enjoy your trip tomorrow. I would love to add some of Rhubab and Ginger to my stash from beautifull Blackbird designs fabric. The Rhubarb and Ginger is great line ... so yummy. Thanks for the great giveaway! Oh my, what a wonderful giveaway. Please add my name to your drawing. Scrumptious looking fabrics! I would love to win--please enter me! I love Moda fabric and of course Blackbird. Thank you for offering this wonderful gift. What a lovely treasure it will be for anyone's collection!! Rhubarb and Ginger is an all time favorite...love love love this fabric. I appreciate your generosity and really, really hope I win one of the four goodies. Oh, that's such a wonderful giveaway! Thank you for a chance.... Love the new fabric line! OMG I loved that line and have used up the pieces I bought so I'd really like to win some. I really enjoyed your class at Primitives this year. Wow, what a generous giveaway, Alma. I always look forward to seeing what you two have in store for fabric, thanks for the chance to win. OH, my gosh........getting the black/beige sampler fabric would be fabulous. We wish that moda would reprint this particular fabric, it is awesome. That is so very generous of you. I am working on trick or treat right now. The new fabric line looks great. The blues caught my eye. Nice name. Who came up with it? What lovely fabrics! I'd love to win some. Thank you for this opportunity. Hmmm..makes me wonder what a rhubarb - ginger pie would taste like! Kudos to your fabric lines, and with hopes of winning a pack. What an awesome giveaway. You ladies have dream jobs in my opinion! Count me in! I love your fabrics! Your new fabrics look wonderful!! Nice to learn the background from the designers' viewpoint, TFS. It should be international law, well at very least an *unspoken rule*, that all shops carry every single BBD line, past and present! Each fold of fabric is super gorgeous, thx for your generosity! How fun! I would love to win some of your lovely fabric. I love the Rhubarb and Ginger line of Modas. I used them in my Home Sweet Home quilt that I love!! I'll bet the Antique Fair line will be wonderful! I would love to enter for a chance on this beautiful fabric! The colors are just beautiful. Thank you for this great contest. Beautiful fabric! I would love to be put in the drawing. Awesome fabric, please include me in the drawing! Awesome! I would love to win this drawing! What a wonderful giveaway! Your fabrics are so gorgeous. The winners will be thrilled beyond belief! Hello Alma -- I would love to win this gorgeous fabric! Please count me in! Hope all is well! I would love to be in the draw for some of your gorgeous fabric! Thanks for the chance. I love your fabric lines, although because they are so popular, they can be really hard to come across. I am looking forward to your new line of fabrics and hope that I can be quick enough to pick some up. What a thrill to make your fabric lines. I love them all and don't really mind them being a little smaller because I always want to buy them all. I LOVE Rhubarb and Ginger..I just finished a quilt that I used several of your groups including the last of my Rhubarb and Ginger. I have the photo posted on my blog. It did turn out beautiful!! Fingers crossed I'd love to win. The fabrics are so so pretty. Please add my name to the hat! Many thanks. OH MY!!! Thanks for a chance to own some of this beautiful fabric! beautiful fabrics. thanks for your generous giveway. Oh my goodness! How very nice of you. I'm a 'fat-quarter-aholic'...this would be a perfect "fix" for me...(and enough to do a covered box or two)! You are going to Polk, NE? So if we were at our NE property now, we could see you zipping down I-80! So what research are you doing in Polk? Beautiful fabrics! Thanks for the chance. I would love to see that library and Antique Fair looks lovely. Thanks for the chance. Those are wonderful fabrics!! Please enter me as I need more fabric...lol! You will be close to me tomorrow, I live in Fremont Nebraska....about an hour and a half away!! Have a good time and thanks!! Oh My! You girls are just too generous...what a lovely collection of fabrics. I love your blog and look so forward to reading it. You are getting so good at posting often...we all love it! Can't wait to see the new line. Thanks. WOW! What a give-away! thank you for the offering. I would use the yardage to back pin keeps, and pillows, and sachets, and make-dos, and, and, and,.............! Those are some yummy yummy fabrics. Thanks for giving me a chance to win. Love your fabric, it would be great to have some! Oooh, how fun! I'd love to win some yummy fabric! I really love this line--especially the cross stitch sampler design. Your work is so beautiful! Of course, I love the fabric!!! Thank you for sharing!!! Alma, you two never cease to amaze me with your gentle colors and natural designs! What a wonderful giveaway. Love that you're giving us a peek "behind the scenes" in the design process. Would love to win! Thank you for the chance at a give away. As I mentioned at Stitchville's retreat in April, it's hard to divide one's time between cross stitch and quilting. This extends to my volunteer time. Just got home from a MN Quilt Assn. meeting and I will be volunteering taking in quilts for our MN State Fair and making sure they are in correct categories. Love your quilts AND your cross stitch! Beautiful fabric! Please enter me. Thanks! Your new fabric line is absolutely gorgeous! But,I love everything you design. This is so generous of you. Count me in, I would love to win any of your fabrics. I was able to attend your workshop in Tulsa and it was such a fabulous time. You two were such a pleasure to meet. I hope I am able to attend more of your workshops. ABsolutely lovely all ruede fabrics! I wish they be mine! Oh lovely stuff, please put my name in. Send that pretty fabric back to Nebraska :^) or just bring it with you tomorrow. Those fabrics are gorgeous. The two of you are so very talented. Please enter me in your drawing - oh the possibilities. Beautiful fabric and very generous of you. I'd love to have the fabric. Thank you for the giveaway. Oh I'd love some!! This line was before I really understood lines so missed it! hello ! i would love to have achance to win these beautiful fabrics ! thank you ! Cannot say how much I love those sampler prints. what a lovely giveaway! I am designing in my head as I type! Pick me pick me! I am really waiting for your new fabric!! You are always replying our expectation. It's interesting how the process works. What I wonder is how the process in your brain comes up with new ideas for the design of new fabrics twice a year. It's amazing to come up with 60 ideas for fabric design. I like the pink print material in the photo;will keep my eye out for this line.I also need to make some new pillowcases,free fabric would be very useful.Thank you for offering the collection. Oh, what beautiful fabrics. I would love to have those pieces. My goal is to make each of my 9 grandchildren a quilt. This would make selecting fabrics so easy. I LOVE this fabric and would be thrilled to win some!! Thanks so much for the chance!! Soooooooooo pretty. Sign me up for your your fab giveaway please. Oh, me, me!! I just love this fabric...all your fabrics...I can't wait to see the new stuff! I love the color choices - and they are beautiful fabrics. Thanks for spoiling us - can't wait to see what you do with the new colors. I love your fabric lines and look forward each one! Your work is wonderful! Thank you for offering the giveway....would LOVE to win! I would love to have this fabric! I have a couple of pieces and I love it! Sign me up Please the fabrics are yummy. Love the fabric! I really enjoyed the brief inside look at some of what it takes to bring fabric designs to the market. Thanks! Oh what a delightful give away. Please include me. I LOVE this fabric - I have a quilt made from it and would love to have more. Very interesting about designing fabric lines too. It would be heaven to have some yardage of this line. Hope I get picked!!!!!!! I still have charms of the Rubarb and Ginger. That was such a lovely line that I hated to use them. It would be so fun to have some more of it! All beautiful fabrics and I would definitely love to win some. Beautiful fabric. So many ideas. Love it. Lovely fabric, can't wait to see it! You are so generous. I love that line of fabric. I have just the pattern I would like to use it on. I am also looking forward to your new line of fabric. I can never have to much fabric! Oh I'm loving the colors in that new line of fabric! I'm going to cross my fingers! What a beautiful selection of fabrics and what amazing generosity. I would love to be entered in this competition, gorgeous fabric, thanks for the chance! Oh Alma! So pretty and so generous! Thanks for the opportunity to win a little of the beauty that you and Barb have created. I could just wallow in it and be easily inspired..........beautiful fabric. Rhubarb and Ginger is one of my favorite fabric lines ever! What a gorgeous pile of pretty. Thanks for a wonderful giveaway! Love your beautiful fabrics! Would love to win the Rhubarb and Ginger and come up with a new project to use it in!!! Thanks so much for giving us a peek at how the fabric industry works :) And please enter me in your very generous giveaway! I would absolutely love to win your beautiful fabric selection! Thanks for the generous offer! BTW, your fabrics are always awesome! The new fabric line is gorgeous. Can't wait for it to be available. Hope I win the giveaway ;-). I would love the opportunity to win a selection of your lovely fabrics! The sampler designs are especially charming. So fun to see a sneak peak of fabric designs in our future. They look awesome. Oh I know this is a long shot, but I would love some of that fabric! It's so beautiful! I love the prints with the alphabet on them! Thanks for sharing the love with us! Loved your Rhubarb and Ginger line! Sure hope I'm a winner.